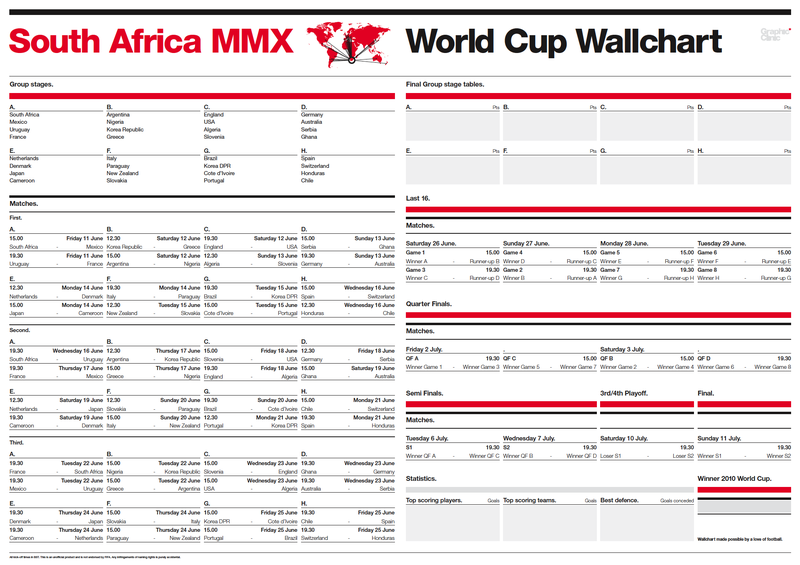 Our friends at The Drum magazine are running a competition to design a World Cup wallchart to help follow the up coming tournament this summer. We spent hours looking at other wallcharts out there and decided that a clear, crisp and typographic solution was the way forward. We’re so pleased with it we thought we should share it beyond the competition — after all, it might not win — so we’re putting it online here for you to download and print off yourself. We plan to update the chart as the tournament progresses with scores, final group tables, last 16, quarter, semi and final scores and teams, giving you a full picture of the event as it progresses. Can you tell we love our football? We should point out that this is an unofficial item and is in no way endorsed by FIFA. Any infringement of copyright or naming rights is purely accidental.